So there he was, Matt Murdock, face to face with the evil mastermind that's caused all of the troubles he's had over the last year and a half. What next? Fight? Cry? Dance? Or something unexpected? As seen in this smashing story created by Mark Waid, and Chris Samnee; Published by Marvel Comics, in May, 2013. Using GENERAL terms, answer the following 4 questions about this STORY entitled 'Fearless'. WHAT'S THE MAIN THRUST OF THIS TALE: "You're doomed" says Bullseye to Daredevil, whilst trust up in an iron lung. "You have to fight Ikari, or else my minions will kill your friends wherever they may lie" he continues. ARE THE MAIN OBJECTIVES ACHIEVED: Nope. I'm not saying anything. Except a fun time was only had by one of the two parties previously mentioned. ANYTHING ELSE HAPPEN: Yes. We get to find out how Lady-Bullseye helped Bullseye come back from the dead. HOW DOES THIS STORY END: With a man without Fear laughing into the night sky. (+) There was nothing about this issue I did not like. The art was very atmospheric and bold. The tale told an actual tale that worked as a conclusion. And, if I'm going to be honest about it, if this comic book was a real life woman, I'd put a f*cking ring on it as soon as possible. Simple as that. (+) The set-up to this tale was pure bliss in a can. Honestly. 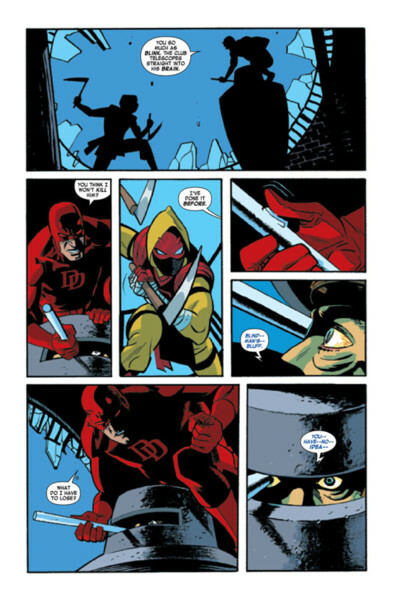 A shiver shot up my spine when Daredevil manoeuvred himself into a stalemate situation. Allowing for what next to follow to be very suspenseful, and very intriguing. 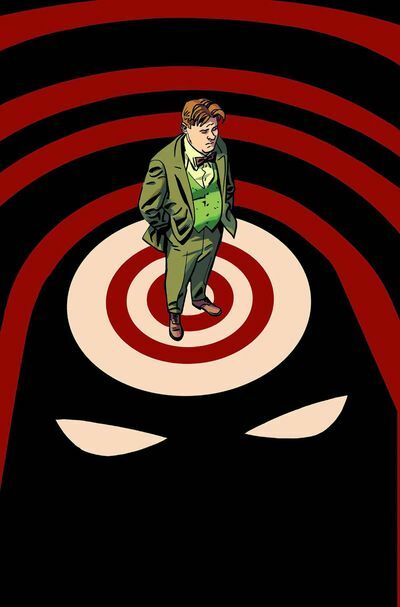 (+) I did like the way Bullseye spoke in monosyllabic and fractured sentences. From a physiological perspective, this stylisation made us -- the readers -- gauge what he was saying more than usual. Taking heed in his plight and demeanour. (+) Now I know that I've said this before, but for the life of me, I feel compelled to mention again how much I loved reading the end of this adventure. It had a twist. It had a solution. And it had something that can comeback and haunt Matt in the future. I mean, what's not to like about that? Wait a minute! I just thought of something to impart during my conclusion! Hmmmmm. (-) OK. So there was that bit where... nah... I liked that. On second thoughts, there was that scene where... oh no... scrap that. I liked that as well. Damn it. I got nothing. The only thing I can find at fault with this issue is that I had to pay to read it. Apart from that though -- nish -- nada -- kaput -- finito. I'm spent. Sorry. A TORTOISE AS BULLSEYE: They're both bulky, fairly immobile, and they eat lettuce through a straw. Yeah. That sounds like a perfect match to me. Heheheh! 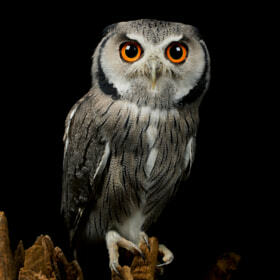 A SOUTHERN WHITE-FACED SCOPS-OWL AS LADY-BULLSEYE: Yep. I'm being very specific for a change, folks. As both of these birds are monotone in hue, and have something funny going on behind their eyes. Look. See for yourself. 'SYMPATHY FOR THE DEVIL' BY THE ROLLING STONES: Ka-Pow! I think I may have surpassed myself with this particular comparison. Come on. Let's face facts. What other story / song combo are nigh on perfection personified? Hello. I hope you are feeling in fine form today, my friends, as I have a favour to ask of you. A very strange favour. Is it possible for you to f*ck-up just one issue please? Just so I can think of something more critical to write about in this review? Come on. I'll be your friend. I'll only spam you once a month on twitter instead of twice. Anyway, to prod you in my direction a tad, I thought I'd help, by providing the following sh*t suggestions. Make Matt a clone of himself who died over twenty years ago. Then, bring him back with a new name, a new attitude, and three other doppelgangers who also think their Matt. Give Matt a speaking space-chip called 'Harold', who's secretly trying to destroy his life by defecating on his friend's one at a time. Due to a cosmic thunderstorm, suddenly, Matt's costume turns into invisible straw that smells of pee. Have a whole issue dedicated to praising politicians and people working in the banking industry. Allow Dan Jurgens to write this book. For no apparent reason whatsoever, turn Matt into a bad-guy called 'Mr Miopic', and then have him spend an entire adventure counting coins in a church. Now I hope that was OK, Mark and Chris. If not, never mind. I'll have to cope with reading your amazing comics, month in, month out, getting surprised time and again with you amazing efforts.